These soft, chewy M&M Blonde Brownies are a fun snack any time of day. Try packing them into your kid’s lunch boxes or snacking on them after school with a glass of milk. Today I am slightly dragging a little. I have discovered that boys are much louder than girls. And by boys, I really mean grown men. Last night my hubby had game night at our house. Seriously I think 5 grown men huddled around a board game are much louder than any group of women for sure. Loud voices and laughing do not make going to sleep very easy. Usually they set up the game in the basement, but last night it was upstairs in the dining room. Of course, it was the room without carpet, so it just echoed through out the entire house. I did stay up for a bit doing some computer work in the office. All I heard was laughing and talking about which army was going to destroy the rest. I finally waved the white flag and went to bed even though they were still going strong on their game at midnight. Thank goodness the closed door blocked some of the sound. Next time I am baking more pans of M&M’s Brownies and Peanut Butter Cup Cookies for them. My thinking is that if they are busy shoving food in their mouth, they can’t laugh and shout at the game plays. 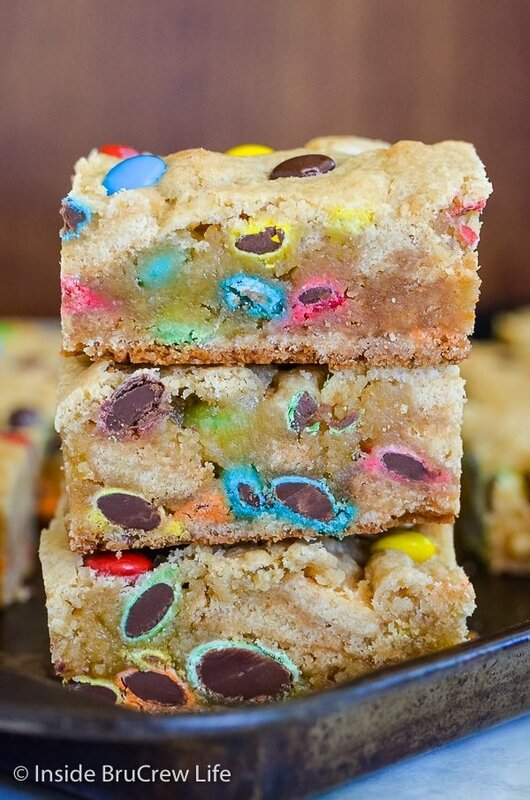 These M&M’s cookie bars are one of my family’s favorite treats. I almost always under bake ours slightly because we like the soft, chewy, and sometimes gooey texture. 22 minutes is just the way we like them. Feel free bake your bars a few minutes longer than that if you like blonde brownies that are a little more done. Just be careful and watch them closely as they bake. It is easy to over bake these bars. These chewy blonde brownies WILL look undone when you pull them out of the oven, but they will set up as they cool. Just trust me on this! If you bake them too much, they will be hard when you cut into them later. 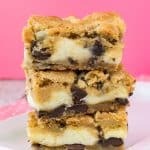 If you are making these cookie bars for a bake sale, I do recommend baking them the full 25 minutes. Gooey under baked treats are only good if you are eating them at home. Make sure you set out your butter ahead of time. Soft room temperature butter is much easier to beat into the sugar. Add the salt, vanilla, and eggs and beat the mixture again. Be careful not to over mix the batter at any point because that can make the top crunchy and crackly. Which is not really a bad thing, but it does change the texture slightly. I prefer the tops of my blonde brownies soft and chewy. Stir in the baking powder and flour until you get a thick cookie dough. Now comes for the fun part. It’s time for adding your mix-ins. Obviously, this batch got loads of M&M candies. Feel free to use miniatures or regular M&M’s. You could also do cookies, nuts, or sprinkles. Or a mixture of all the above. Make sure you store the blondies in a sealed container. They will stay softer longer if you keep them from getting dried out. Of course, if your family is anything like mine, you will not have very many M&M Blonde Brownies to deal with. I love changing up the colors of the candies for different holidays. The rainbow of colors from the candies is so pretty when you cut into the M&M bars. Pink and red M&M’s would make these so pretty for for Valentine’s Day. Use mint M&M’s for St. Patrick’s Day. A bag of pastel M&M’s would be perfect for Easter. Red, white, and blue M&M’s would turn these into the best patriotic dessert. 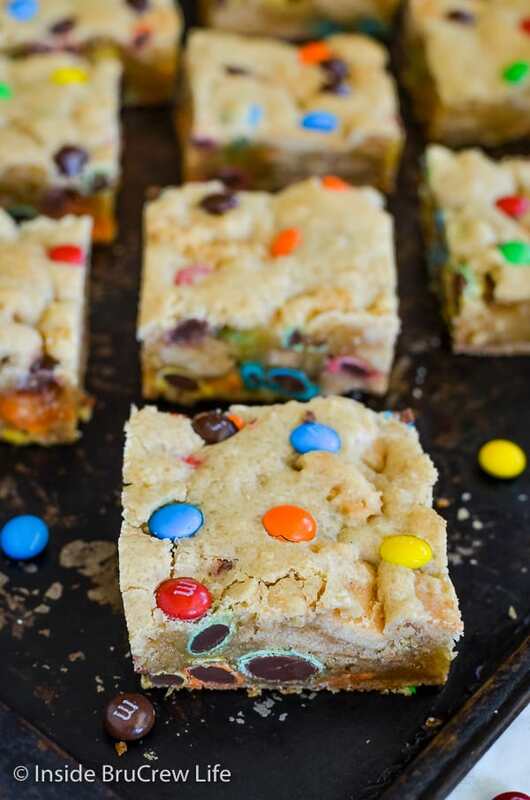 Use orange, brown, and white M&M’s for a Halloween cookie bar. And of course, red, white, and green M&M’s would be so pretty for Christmas. See how easy it is to transform this easy recipe into a fun holiday dessert? You can also use any other candy in place of these M&M’s. Reese’s pieces are super yummy too! Gooey marshmallow and Reese’s Pieces candies add a sweet goodness to these Marshmallow Reese’s Blonde Brownies. 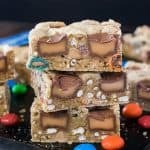 Lots of candy and pretzels makes a pan of these Caramel Pretzel Peanut Butter M&M Bars disappear in a hurry. 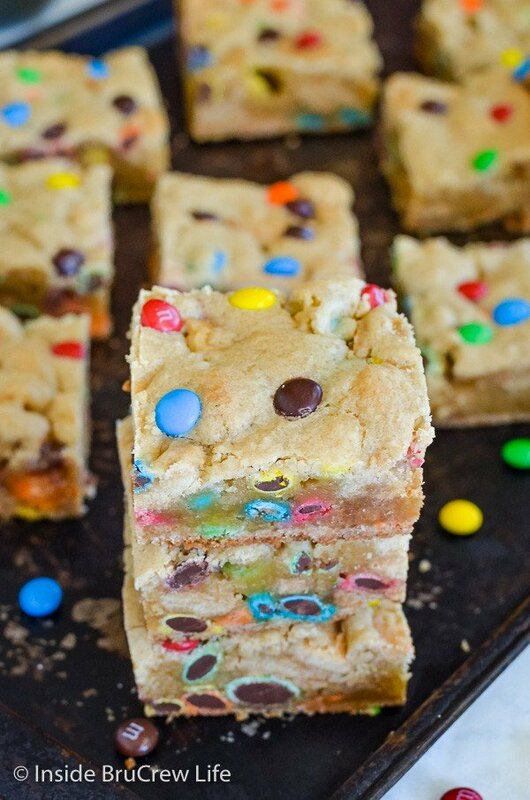 These Nutella M&M Bars are easy cookie bars that are made in one pan. 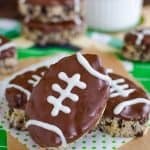 These soft and chewy chocolate filled Congo Bars are a great recipe to make the next time you have company over. A pan of these S’mores Sugar Cookie Bars would never last long around me. I love a good chocolate, marshmallow, and graham treat! These easy M&M Blonde Brownies are loaded with candy goodness. A batch of these cookie bars never last very long in our house. Preheat the oven to 350 degrees. Spray a 9x13 baking dish with nonstick spray. Beat the butter and brown sugar until creamy. Add the eggs and vanilla and beat again. Sift together the salt, baking powder, and flour. Slowly beat into the butter mixture. Stir in 1 cup of the M&M candies by hand. Spread the batter in the prepared dish. Sprinkle the top with the extra 1/2 cup candies. Bake for 22-25 minutes. Let the cookie bars cool completely before cutting into squares. Makes 24 bars. Store in a sealed container. **If you are making them for a bake sale, bake them the full 25 minutes. 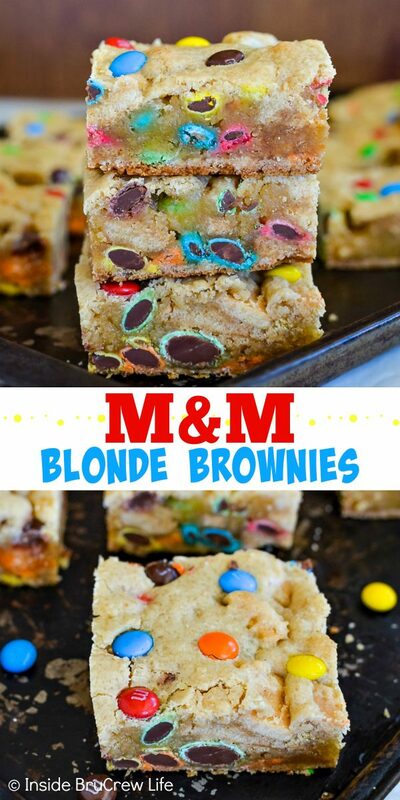 *This post for M&M Blonde Brownies was first published on March 11, 2014. It has been updated and republished on February 15, 2019. I made these today with my niece and they were so yummy! Thanks for such a great recipe! You are right … boys are noisier than girls! I cannot agree with you anymore – grown men are a lot louder than women! I swear they are. 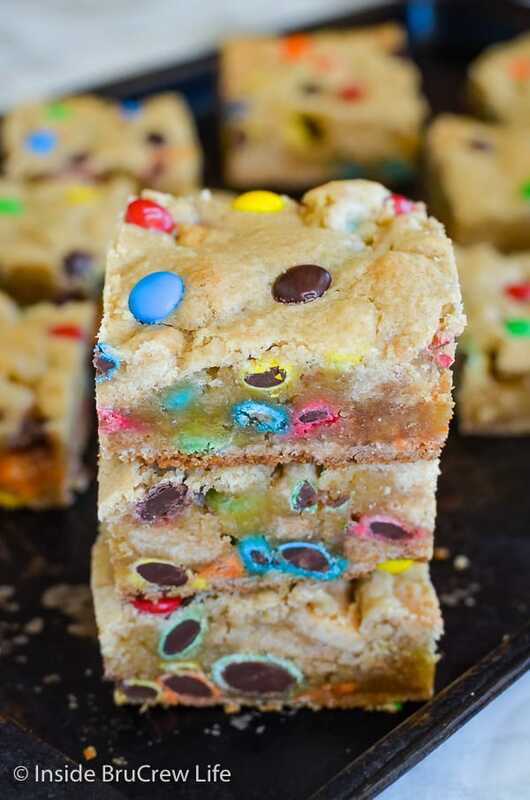 I LOVE the idea of making more of these awesome looking blondies to keep them quiet. Isn’t it funny how not getting enough sleep now makes us drag so much? But when the kids were little we were so used to it or maybe just delirious? I’m totally the same way! And I too love my blondies under baked! UNLESS they laugh and shout WITH brownies in their mouths, and then that could be problematic. I only say so cuz I know food has never stopped me from being awful and talking. >_< That's why I can't have nice things like these awesome brownies LOL. These bars look totally amazing! I think I will make some of these with the Easter M&Ms for an Easter treat! I would love to see a blonde made with Sugar Babies candies and toasted pecans! Serve this with vanilla ice cream with caramel sauce! Decadent! I love everything about these and I want them so badly right now. I’m addicted to a blonde brownie! I want to sink my teeth into these right now! I’m having some serious sugar cravings today. They look so good and gooey. I will put it to the test next game night, and see how it goes! Haha! Underbaked is the best!! I love this recipe Jocelyn, SO GOOD. Always underbake for sure!! That is my favorite! Those look delicious! 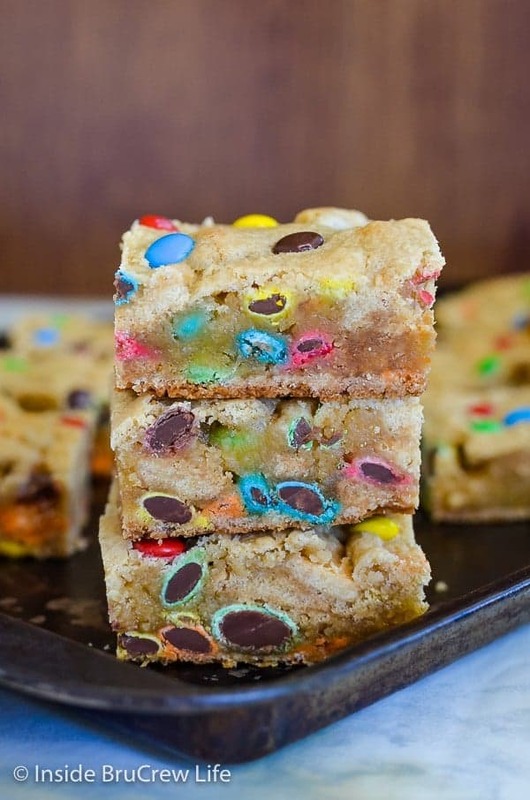 I love blondies and M&Ms! The inside looks so perfect, all chewy and delicious. I want to reach through the photo and grab one! Love these bars! Perfectly gooey centers! Haha, so true! Thanks Karly! The best desserts I think come from when you just pull things out of the cabinet and go for it! 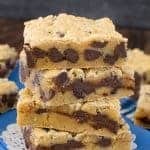 These blondies look amazing and so chewy! What delicious looking brownies… Yum! You have an amazing blondies collection! 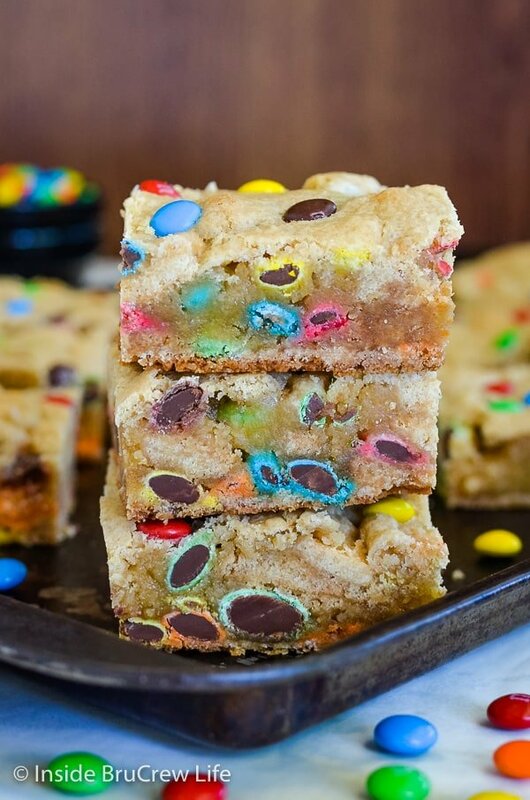 These M&M blondies looks super delicious! I really need to get in the “Blondie game”, I have never made them! I need all of this NOW!! Ha ha, this looks amazing! These are in the oven right now! Im soooooo excited to see how they turn out!!! :) Thank you for the recipe, and thanks to Pinterest for me being able to find it! Yay! They are soo yummy and so rich…I can’t even eat one without craving milk…not a bad thing 😉 . Thanks! These are so delicious, and pretty too! 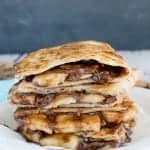 Fun summer snack to make with the kids! Thanks!!! I made these today with pLAnS of taking them to a church dinner tomorrow. My family convinced me to eat them today. I’m glad I did! Under asked is one thing. These were raw. Batter running everywhere when cut and they were completely cooled. It took an extra 10 minutes to get done to an edible consistency. They are delicious but I was very disappointed at the first attempt. Glad I cut it tonight or I would have been one embarrassed lady at church! I am so sorry to hear that you had problems with these bars. I always bake mine for this time and temperature and they are never raw or runny. Wow! I just made these as a surprise treat for my kids after school. I took a piece as a sample and wow ! terrific. Will def make again! I just made the brownies, made to the exact measurements and times you said. Mine were WAY raw in the middle. so much that they would fall apart if i tried taking them out. I feel like the recipe is missing something or I did something wrong. I am so sorry to hear that! But no, the recipe is exactly the way I make them every single time. How soon did you cut into the bars? They are gooey when they are warm and first out of the oven. I always undertake mine slightly, but at 24 minutes they are never raw coming out of my oven. All ovens are different though, so maybe just bake the next batch slightly longer. I hope that helps! Oh, how tempting they look!!! I’m getting hungry for fun now!!! I am so glad that they still tasted amazing! I wonder if your oven runs hotter than mine. Ours always take about 22-24 minutes to bake to a slightly under baked goodness. Hi there. Two problems with this recipe. The batter was so stiff that I had to press it into the tin with a fork. It definitely needs some more liquid in it. In addition 24 minutes in the oven resulted in rock hard brownies. I’ve seen recipes where melted butter is used, so I am wondering if this might make the batter better? Well, something is definitely not right with your batter. How soft was your butter when you started and did you use both eggs? It should not have been so stiff that you had to press it in the pan with a fork, and 24 minutes should have resulted in still slightly under baked brownies. I have made these so many times over the years and have never had a problem with the recipe the way it is written. Made these for a bake sale and people went nuts over them. All the parents and staff wanted more, so I will make another batch as it is a week-long thing. Sold out straight away. Thank you for sharing the recipe! I’m sorry but this had to b the worst recipe ever. Came out as hard as a rock and I followed the ingredients to a T.
I am so sorry to hear this didn’t turn out for you. I have made this many times, and I have had lots of people who have made it and loved it too. Something must have gone wrong when you measured or baked it. All ovens do bake differently and also elevation plays a part in baking time, so that might have caused it to over bake. Mine came out a little hard too. Taste great though, and they ate every single one (the only person who noticed they were over-baked was me)! I believe this was all user error (AKA my fault! ), because they didn’t look or feel done, and I let them continue to bake after the directed time. I came back to re-read the recipe and see where above the recipe you say they will look under-baked and not to overcook…guess I need to quit skipping ahead to the recipe card! Great way to use up the copious amounts of M&M’s we have leftover from after holiday sales, thanks for the recipe! I’m glad to hear you didn’t have any leftovers! And I’m glad you saw the mention about not over baking them, even it was too late. I’ll add a note in the actual recipe card for future bakers. I usually only bake ours for about 22 minutes because I love them under done. It all depends on your oven too…some ovens run hotter than others so they will cook faster. I make these all the time. This is my number one go-to recipe for a quick, easy, delicious dessert. 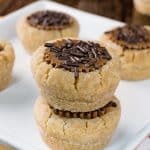 I brown the butter which gives it a little bit of a nutty flavor and I bake for no more than 20 minutes so they are soft and gooey. I find that any longer than 20 minutes in my oven and they come out hard. These go fast and I don’t usually have much left! These are a favorite in our house too. They usually never last the day with 3 hungry teenagers grabbing at them. Brown butter is the bomb in these, so I’m glad to hear you do it too. I usually only bake ours about 22 minutes because I love them slightly underdone. It does all depend on ovens and how hot they run. Made these using Bob’s Red Mills 1 to 1 Baking Flour. Cooked for 30 minutes (gf cooking always takes a few extra minutes). Turned out awesome! Yummy! That’s awesome to hear they turned out great with the other flour! Hi what flour do you use plain or self raising ? I use all purpose flour in all my recipes, unless it specifically says something else. I hope you enjoy the blondies! Plain! I used SR – epic fail ???? Are the measurements metric cups or us cups . All the recipes on our site are in US standard measures. can you use baking soda in place of powder? Baking powder and baking soda are two different leavening ingredients. If you need to use baking soda, only use 2/3 of a teaspoon plus 3/4 teaspoon vinegar or lemon juice to activate it in the dough. I can’t seem to get these to work 🙁 they always end up rock solid on top and uncooked on the bottom. Any idea where I am going wrong? If I cook for less time the mixture is literally uncooked and runny underneath! FYI, they still rate yummy! Are you sure you are only using the right amount of butter? I only ask this because once I accidentally doubled the butter and ended up with the runniest center ever. My boys still thought it was amazing. LOL! Also how long do you beat the butter and sugar mixture before adding in the rest of the ingredients? I have found that beating that too long results in a crunchier top. Do I need to use real butter? I always use real butter. Margarine is made with water so it affects how things are baked. Plus, butter just makes everything taste better! I’m super disappointed. I was baking these for a fundraiser for a little boy with cancer, and I don’t think I can sell these ????. I’m afraid people will think they are too under cooked. Oh, no I’m so sorry to hear that! Have they cooled completely? They do set up after cooling. We do tend to like ours slightly under baked because they are absolutely amazing that way. How long did you bake them for? I made these as the recipe states. I thought these were too sweet. Won’t be making again. I’m so sorry you feel that way about these brownies. They are made with butter, sugar, and candy, so it’s going to be sweet. These totally would not last 5 minutes in my house! A big favorite here!!! Yum! These are so fun! Love them! These were amazing! Thank you so much!